It doesn’t really matter whether you are working in dry or slippery or very hot or cold conditions, wearing a pair of work boots is always a good idea. These boots are made to provide comfort during the long working hours and to protect your feet from different objects and substances that can result in injuries. Chemical resistant work boots are a special type of work boots, perfect for people who are working in environment where different types of chemicals are present. Some power plants and many factories that work with chemical agents are potentially dangerous environment for people who don’t take proper care about the outfit they are wearing. With a pair of good chemical resistant work boots, this problem will be resolved. These boots are usually made from different durable materials that were carefully selected by the manufacturer. They have tested the materials on different chemical agents, so they can guarantee that the feet of the wearer are protected. At the same time, they are implementing technology that will allow the wearer to feel comfortable while they are working. 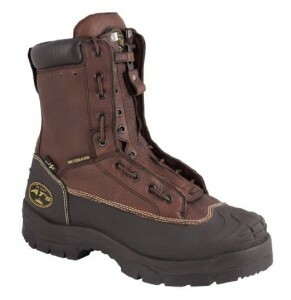 We have created a list of chemical resistant work boots that are worth your attention. Those who have some experience with work boots have probably heard about this brand. Honeywell is a footwear manufacturer that has many different work boots in their offer. 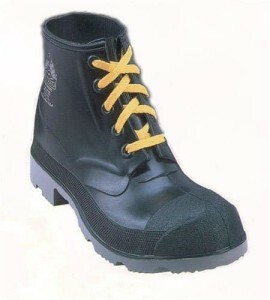 IN the recent period they have introduced several chemical resistance work boot models including this one. 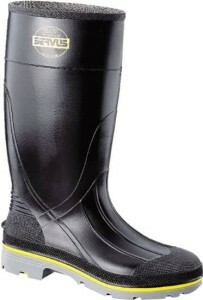 This model is waterproof and comes with a special Servus XTP chemical resistant technology. People can notice that these boots are high which means that it is not only the foot of the wearer that is protected. What is interesting about this model is the TDT self-cleaning outsole which is very important with people who are working with chemicals because things can get really messy in facilities like this. The outsole is designed in a way which provides great traction and durability. Finally, the presence of the yellow midsole trimline shows us that these are actually steel toe work boots. For those who don’t know, this means extra protection for the front part of your feet. Although this pair of chemical resistant work boots might not be the highest, they still provide excellent protection. This pair of boots has a 6 in height. They come in black color which means that you can wear them with any outfit you want. What is good to know is that this Onguard work boots are following the strict ASTM F 2413-11 standards. Even though the basic purpose of wearing such boots is to keep your feet safe from the negative effects of chemicals, they are also good for people who spend a long time of the day standing. In addition, these work boots are slip-resistant. Most chemical resistant work boots are made of rubber, but this model from Oliver Footwear is made of a combination of rubber and leather. So, if you need something trendy and safe, we highly recommend this pair of work boots. The upper is resistant to chemicals, barnyard acid and liquid. In addition, they have so-called TPU SAFETY cell reinforcement that keeps them safe from abrasions and cuts. Although they have all these features they are still lightweight. The rubber midsole are capable of absorbing almost any type of shock. They follow several different ASTM standards.